After watching License to Kill and The Living Daylights, I have a new appreciation for Timothy Dalton. I feel like he is second or third behind Sean Connery and tied with Daniel Craig. I mean I just think he fit the James Bond profile, he had great hair, he was charming and suave, he knew how to fight. I mean this guy made a great James Bond and I wish that he had had done more films. I was a Dalton champion since his announcement way back in 1986. Although at the time the only thing I knew him from was Flash Gordon, something told me this guy was the right choice. I was one of the few people glad Brosnan wasn't selected because I feared it would be Roger Moore 2.0, and that's not a put-down of either, just that there needed to be a different direction, something closer to the harder edge Connery brought. The first footage I saw of Dalton was a shot in an editing room of him on the tram following Kara and that look just screamed Bond to me. The more footage I saw the more I was convinced and it was confirmed when I saw TLD He is the closest physical image to the man in the books in my view. I was one of what seemed like the very few who mourned when he "left" the role. I wanted more of that direction and, honestly, that somewhat shaped my reaction to Brosnan. I find it satisfying that in light of Craig's portrayal that Dalton is getting more respect for what he did, although he and Lazenby still seem to get brushed to the side in favor of the other 4 actors in some advertising and retrospectives. Turn, my friend, you are not alone. I was exactly in the same place back in '87 - I felt TD was an ideal choice (well, I will admit in the early '80s I was Lewis Collins obsessed!!!!) to bring the dangerous edge to Bond that had been seeping away for a decade. TD was always a tough fit for those expecting Brozza - how Brozza would have played it in '87 we'll never know (but I'll take '95-02 rather than pining for Brozza in '87), but I think the audience (at least the large American audience that has so much clout in setting Hollywood expectations) were conditioned that the films would continue as they had, due to Broz's Remington Steele background. And while TLD seemed successful in weaning film-goers into a harder-edged Bond, LTK was ultimately too much, too soon. I love LTK, but I get its faults, but I'm always unhappy that it's TD who ends up carrying the can for a lot of things outside his control when the series went on hiatus. I'd love to have seen him get a shot at a third, and I think a GE in 91 or 93 with TD would have been a massive hit that would have "sold" him to that overly-important US media. None of this is a knock on Brozza BTW - but I don't doubt for a moment that TD paved the way for Brozza to go about his onion-peeling (you know me, I love getting that in Brozza posts ). And thanks to TD's abrupt, and to non-fans, jarring process of re-tracking the series' direction, Brozza got to play his James Bond, rather than inheriting Sir Rog's. 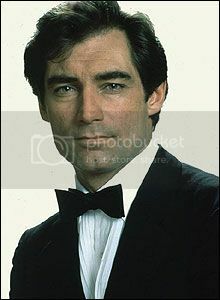 I may not have been alive in 1986 or 1987 but Timothy Dalton definitely fit James Bond. Timothy Dalton is THE best James Bond. The best there is, the best there was, and the best there ever will be! Dalton has always been a favorite of mine, he got bumped down to third place after Craig's performance in Skyfall. Completely agree with this. Dalton's my favorite, by a very, very large margin. Iceskater101, awesome pic you chose and could not agree more with your post. He is still my favorite Bond, even after Skyfall. There is just something so dashing and charming about him... (and so romantic, especially in TLD). He was the perfect mix of English gentleman and wild, unpredictable danger. As a valued forum member has on their signature... Timothy Dalton's Bond is Daniel Craig's Bond 20 years ago. He was the first Bond I ever saw in 'Licence To Kill', and in my heart of hearts, Daniel Craig is current and exceptional and a great 007, but for my one solid answer, it has to be Timothy Dalton. He's a cold assassin, but has warmth and humour when it suits without shovelling it out in droves. He's the closest adaptation of James Bond that Ian Fleming wrote about, and it's so sad he only got 2 films. But what an impact - he brought a new side to 007 after Roger Moore's brilliant run and shaped a new mould for future actors to take him in. 'Licence To Kill' was too real for Bond, but that is something Fleming would be proud of seeing on screen - a wounded man, out for revenge, using his greatest skills as a secret agent. The two films ooze their own individual style, class and cult status for their own reasons. Great characters, brilliant stunt work and very memorable moments. Dalton only created a huge fan base from just 2 films, and his popularity is rocketing after we see that the decade was against him as Daniel Craig nailed it 20 years later, something Dalton did in his films but the world just wasn't ready for it. He's a brilliant man, and a brilliant Bond and I love him. This is about where I stand. Some times I interchange Dalton and Craig but I think Craig is sitting in second spot for me now. For the record, Moore is my least favourite though I still enjoy him in the role. I know that's why I like him, because in the Living Daylights he is so romantic towards her. It shows him in a sensitive light and makes him less sexist like in the books. Yeah that's nicely put unpredictable danger and he is a gentleman. Ahhh I love him! No, Turn, you're not alone. I also mourned Dalton's replacement. I enjoy "GoldenEye" a good deal, but when I watched it for the first time, I saw Dalton in my mind's eye. You've got to love the Excellence of Execution. Dalton is on the bottom of the Bond list for me. He has little appeal and his ticket sales proves it. Both his films made money. Look it up. Ticket sales seems like a strange criteria for judging one's qualities, more like followng the crowd. Put me down as another huge Dalton fan. I remember when he was announced being ecstatic, having found him quite memorable in the otherwise forgettable Flash Gordon movie from 1980. I was already a Bpnd fanatic by this time, and was aware that he had been a replacement for Brosnan going in to see TLD. After being so disappointed by AVTAK, I was mesmerized and instantly proclaimed Dalton the successor to Connery, though I was and still am quite a Lazenby fan. LTK, while too dark for loads of folks, was exactly the kind of Bond I was hoping to see and I hailed it as the best 007 adventure since OHMSS and Dalton was Bond for me in every possible sense, something that Moore had never fully accomplished to my personal taste, though I greatly enjoyed many of this movies. I've always felt that we were cheated out of a third and possibly more Dalton 007 movies in much the same way I would have loved to see Lazenby follow up OHMSS with a string of movies. Dalton sits comfortably in my top 3 to ever play Bond, alongside Connery and Craig. His ticket sales just reflect the sharp decrease trend in movie theater attendance during the eighties. But his two films were highly profitable and are among the bests for me. I'll concur that Timothy Dalton is the best Bond or at least as good as Sean Connery. Haha okay.. whatever. Ticket sales have nothing to do with how Timothy Dalton did as James Bond. I am sure you also feel that since he did two movies that it proves that he was a bad James Bond. I definitely disagree with you. I was never a fan of his dimple chin although its not as bad as Lazenby's. Oh, no question. It is nice to know there is a fellow fan floating about here on CBn! If you don't think bad ticket sales is a reflection of his lack of appeal/excitement for Dalton I think you're fooling yourself. TLD was the first Bond I ever saw in the theater and pretty much my vision of Bond, especially after reading Ian Fleming's original works. I sometimes dream of a cool parallel universe where Moore quit after MR, and Dalton was brought in for FYEO, OP, and AVTAK. Can you imagine how much cooler those three would have been without the old and creaky Roger Moore? I won't beat a dead horse since you obviously are set in your criteria as to what consitutes success, in this case bad equals underperforming against competition although still profitable. But let me ask one last thing. In your very obvious rankings of the films in the series below your signature you list OHMSS no. 3 overall. Lazenby is nearly always ranked as dead last in surveys of Bonds actors. OHMSS was considered a bomb upon release although it made money. In recent years the reputation of OHMSS and Lazenby have risen considerably in fan circles and among some general moviegoers' estimation. Do you consider ticket sales as the measure of success for Lazenby and OHMSS? On a budget of $40 million, The Living Daylights made $191.2 million. Higher than the previous two Roger Moore films. On a budget of $32 million, License to Kill made $156.2 million. Not as much as Daylights, but still very profitable. It didn't do very well in the US but intentionally it made up for it. So, taking the facts into consideration, where are these bad ticket sales? And since when do sales equal quality? Justin Bieber releases platinum albums. Does that mean he's the best singer of all time? ^ Exactly. We get it though, you don't like Dalton because of his ticket sales. I completely disagree and I think he was a very successful Bond especially because License to Kill is regarded as one of the legendary Bonds. Dalton films are 21st and 23rd in ticket sales I believe. That is just plain horrible. You would think if the films had good word of mouth they would have better ticket sales I suppose. Now why those movies didn't have good word-of-mouth I can't be sure. Seems like some blame should lie on Dalton. I didn't hate Lazenby. In fact, I would probably rank him third behind Connery and Craig. I wish he had been given a chance to do Diamonds are Forever. I am set in my opinion but not trying to troll the thread by bad mouthing Dalton to you all. It does seem like there is often a lot of Dalton love for those that feel he represents the literary Bond so well. I prefer to distance my literary Bond and movie Bond a bit. Judging Timothy Dalton is tough for me. I absolutely love The Living Daylights, it's a top three Bond film for me. Dalton himself is dangerous and cool with plenty of wit. The action is well-scripted and the supporting cast is memorable. Not big on LTK though. Too serious with no substance beyond your typical 1980s action film and the main Bond girl, Carey Lowell falls completely flat (personality and look) for me as the main Bond girl. Shout out to Talisa Soto though! Ultimately, there just isn't enough of Dalton's Bond for me to sample to really make a fair comparison. As it is now, I just can't put him ahead of Craig, Brosnan, Connery, or Moore. They all have at least 2 or 3 entries I really enjoy, Dalton only has the one. Edit: Craig and Dalton's interpretations don't seem as similar as some here like to project. They both put a serious slant on the role, beyond that I don't see many similarities. They both have occasional moments of wit and humor, but Dalton's Bond all around seemed like a content, happy guy. Craig's Bond is more raw, more real and with obvious demons. Edited by 00 Brosnan, 25 November 2012 - 08:09 AM. No substance? How about Bond showing some emotion when Della throws him the garter due to what it represents (to him it represents the loss of his wife on their wedding day). And then the maiming of Felix and the death of Della on THEIR wedding day is too much for him to bear. Even the proper English Gentleman who always puts duty first cannot let this one go. He disobeys orders because of his personal feelings, and cannot let the man responsible get away with it, just like he couldn't let it go when Blofeld killed Teresa. This is stuff of serious substance, far beyond any Bond movie before it, and more than any afterwards until Casino Royale. Which is why I like Dalton's Bond more than I like Craig's Bond. He's got feelings and demons (particularly the Teresa thing), but he's not filled with ANY self doubt and he's not at all conflicted about who or what he is. He's a hard man, but one with feelings deep down. Dalton NAILED the role and deserved at least one more Bond movie.